Georgetown Town Hall is located at 1 Library Street, Georgetown, MA 01833; phone: 978-352-5713. Photo: Adams-Clarke House, ca. 1725, 93 West Main Street, Georgetown, MA. Listed on the National Register of Historic Places in 1990. Photographed by User:Magicpiano (own work), 2012, [cc-by-3.0 (creativecommons.org/licenses/by/3.0)], via Wikimedia Commons, accessed August, 2014. Churches were the cultural centers for the town's early settlers. Recognizing the need for formal education, the first one-room schoolhouse was built in 1739. A few years later, there were one-room schoolhouses in various locations around town. Georgetown's first library was the Agricultural and Social Library which was a private library founded in 1806. The first free public library was not built until 1866 through the generosity of George Peabody, an English philanthropist who had family ties to Georgetown. Upon completion of the structure, the Agricultural and Social Library added their book collection to the gift of 2,400 books shipped by Peabody from England. The library and schools continue to be the town's cultural and educational centers today. Native American stone artifacts have been found on Baldpate Hill and near the Parker River revealing evidence of Indian campsites. There are reports of unusual stone formations in various wooded areas that could possibly be ancient house foundations, but these have remained undocumented. The last key to any archeological discoveries may be in the outlying areas of the town where stone walls that once marked the boundaries of the original landowners still remain. 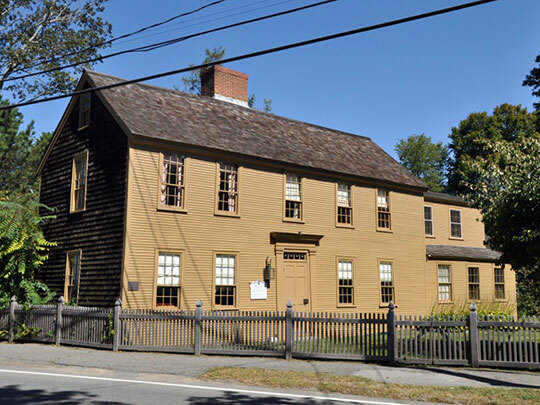 The oldest structure, and most significant historical area, in Georgetown is the Captain Brocklebank House, c. 1660, which is located at the intersection of East Main Street and Elm Street. Today, it is a museum operated by the Georgetown Historical Society. Across from the house is a restored one-room schoolhouse which was built in 1828 on Andover Hill but was moved to the Brocklebank site in 1984. Also on the grounds is a small shoe shop, a remnant of the early 19th century cottage shoe industry. Across the street on the southeast corner of Elm and East Main stands the Nathaniel Nelson House built in 1797. On the opposite corner is the Adams House, an exceptional example of the Greek Revival style. It is the only structure in town having a portico with Greek columns. Along the length of Elm Street are many of these well preserved 18th and 19th century homes. Throughout the center of town, a few of the old shoe factories are still standing; some have been converted into homes while others contain a variety of businesses. Also, historically significant is Union Cemetery containing tombstones dating back to the 1730's and Harmony Cemetery dating back to 1830. There are Georgetown families today who can trace their ancestors on these ancient stones. In the pages of the town's history, these past generations played an important part in the growth and prosperity of Georgetown. Town of Georgetown, Georgetown Master Plan 2007, www.georgetownma.gov, accessed August, 2014.